Lautenberg, 89, was the last World War II veteran serving in the Senate. He is mourned in Washington by a long list of former Senate colleagues, including the president, the vice president and the secretaries of state and defense. “Frank was a good friend and respected colleague,” Defense Secretary Chuck Hagel said in a statement released June 3 at NATO headquarters in Brussels. Lautenberg’s “passion and his leadership will be missed,” Hagel added. Lautenberg served in the Senate representing the state of New Jersey from 1982 until 2001, retired briefly, and then was elected again in 2002. The late senator was a leader on environmental issues like control of toxic substances, safe transport of hazardous materials and cleanup of contaminated land. He particularly fought for better stewardship of Earth’s oceans. In the 1980s, when used syringes washing up on New Jersey’s beaches threatened public health, Lautenberg authored legislation requiring a tracking program for medical waste. He also authored a 1988 law that banned ocean dumping of sewage and plastics. Actress Sigourney Weaver greets Lautenberg as Representative Jay Inslee looks on at a September 2009 screening of the film Acid Test: The Global Challenge of Ocean Acidification. The Beaches Environmental Assessment and Coastal Health Act of 2000, known as the BEACH Act, was another Lautenberg initiative. The law, signed by President Clinton, requires consistent water quality standards across all states and enhanced the public’s right to know about the safety of beaches. Following the 2004 spill of more than 1 million liters (265,000 gallons) of crude oil into the Delaware River from the Athos I, a single-hulled oil tanker ship, Lautenberg fought to force oil shippers to switch to double-hulled tankers. His legislation set new standards that nearly tripled liability limits for shippers that continued to use single-hulled vessels instead of the safer double-hulled vessels. The senator also authored provisions to fund research and protection of deep-sea corals, another habitat threatened by ocean acidification. Those provisions became law in January 2007 as part of the Magnuson-Stevens Fishery Conservation and Management Reauthorization Act of 2006. In March 2009, Congress passed Lautenberg’s Federal Ocean Acidification Research and Monitoring Act, which established a federal committee led by the National Oceanic and Atmospheric Administration (NOAA) to research, monitor and coordinate activities on ocean acidification across federal agencies. Oceans require a balanced pH to maintain water quality favorable to marine life. If oceans become too acidic, the shells of scallops, clams, crabs, plankton, corals and other marine life begin to dissolve. In Lautenberg’s state of New Jersey, sea scallops and clams are some of the most important species for fisheries, valued at $121 million, according to NOAA. Lautenberg’s measure, in addition to establishing the federal committee, also created an ocean acidification program in NOAA — the federal agency with primary responsibility for preserving the health of oceans and marine life. The law was supported by a wide range of environmental and conservation groups, including the Marine Conservation Biology Institute, Greenpeace, the Natural Resources Defense Council, the Marine Fish Conservation Network, the Climate Institute, Environmental Defense, Gulf Restoration Network, Ocean Conservancy, Coastal States Organization, Oceana, Surfrider Foundation, the Nature Conservancy and the World Wildlife Fund. 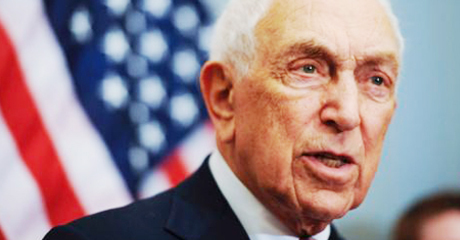 “I am deeply saddened to hear of the passing of Senator Frank Lautenberg,” acting NOAA Administrator Kathryn Sullivan said in a June 3 statement. “He was a true statesmen, advocate for his constituents and champion of our nation’s oceans, habitats, and coastal communities. Frank was a hero for the oceans. He was not only a friend I cared for; he did great things for deep-sea corals and many other kinds of marine life.